Hilary Kennedy recently contacted me to set up an interview for the You + Dallas blog! You may know Hilary as the face of Dallas' KFWD Channel 52, "Just Fun TV", or from the US Youth Soccer Show on the FOX Soccer Channel in over 32 million homes. She is also a host of Home and Lifestyle TV on NBC5, spokesperson for YouPlusDallas.com, author of Career Diary of a TV Host: 30 Days on the Job and Style and Shopping blogger for CBS. She was voted one of the Ten Most Beautiful Women in Dallas by D Magazine and was featured on the Rachel Ray show. Hilary is amazing! :-) Her blog, Career Diary of a TV Host, discusses style, life, and, of course, the hottest things to do in Dallas! Congrats on the interview! Very exciting and a wonderful opportunity! Congratulations! I am new to your blog and can't wait to start trying out recipes! I know my steak and potatoes man will thank you for the inspirations. hee hee! 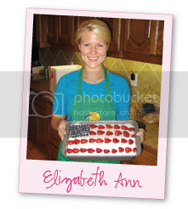 congrats elizabeth ann!! it is about time your blog got noticed because you have so many wonderful things here. good for you!